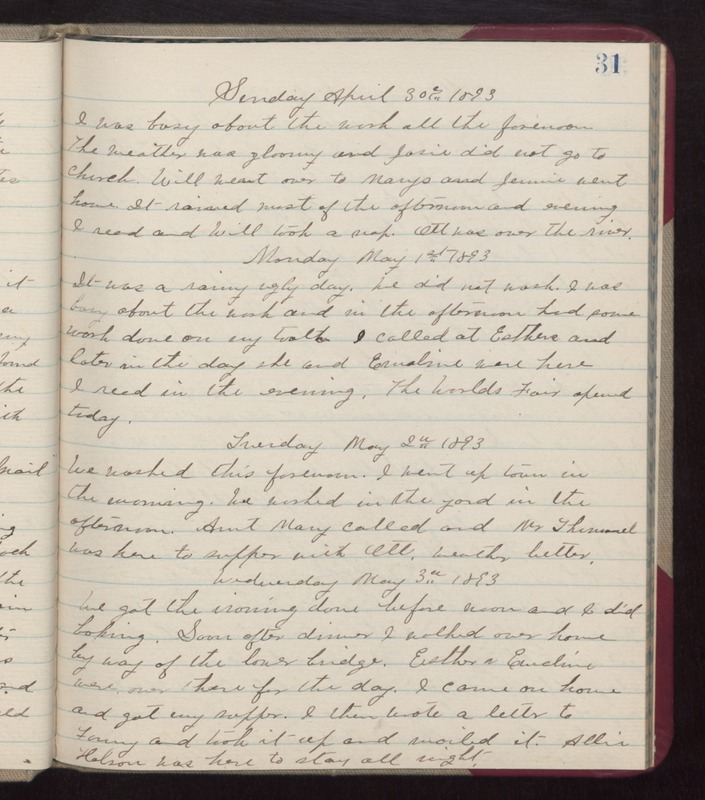 Sunday April 30th 1893 I was busy about the work all the forenoon. The weather was gloomy and Josie did not go to church. Will went over to Marys and Jennie went home. It rained most of the afternoon and evening. I read and Will took a nap. Ott was over the river. Monday May 1st 1893 It was a rainy ugly day. We did not work. I was busy about the work and in the afternoon had some work down on my tooth. I called at Esthers and later in the day she and Emeline were here. I read in the evening. The World's Fair opened today. Tuesday May 2nd 1893 We washed this forenoon. I went up town in the morning. We worked in the yard in the afternoon. Aunt Mary called and Mr [Themuel?] was here to supper with Ott. weather better. Wednesday May 3rd 1893 We got the ironing down before noon and I did baking. Soon after dinner I walked over home by way of the lower bridge. Esther & Emeline were over there for the day. I came on home and got my supper. I then wrote a letter to Fanny and took it up and mailed it. Allie Halson was here to stay all night.